When asked to name some of the greatest players to have ever played in La Liga, the same names inevitably crop up; Cruyff, Zidane, Ronaldo, Messi, Rivaldo, Xavi, and so on. Those mentioned are all legends of the game; they all had – or have – that sublime ability to produce wonderful moments of mesmerising skill and technique. There is one player, though, that often – and unfairly – gets overlooked continually – Fernando Redondo. He was considered a defensive midfielder, the classic ‘Number 5’ of Argentina. He did all that the job entails; breaking up opposition’s attacks, man-marking, and biting into challenges. Although to leave it at that would be an insult. As well as the defensive side of his game, Redondo was also a deep-lying playmaker. The brawn was always accompanied by the brain. Quite simply, he had it all. He began his career in his home country at Argentinos Juniors, playing there for five years before he made his big move to Europe. The move – in 1990 – was to Tenerife of Spain, Redondo spent four years at the club and made 103 appearances. During his spell, he impressed with his ability to contribute to both the defensive and offensive parts of the game. In 1994, Real Madrid were left convinced by his consistent displays of sheer control for both Tenerife and Argentina – they snapped him up and the golden era began for Redondo. His first season with the Spanish giants was a success as they won the league title. This was only the beginning, though, as Redondo became the main man for Real Madrid in their midfield. He well and truly stepped up to the mark, improving his all round game and perfecting the outrageous talent he had. Never blessed with genuine pace or an engine that allowed him to cover every blade of grass, he relied on his positioning and ability on the ball. He intercepted the ball continuously, tackled hard with precision and then his head was up. Always looking, and always aware. He saw the big picture; knowing exactly what would pan out before anyone else did. How? Because it was he who was controlling that tactical picture with his left foot. As soon as he had possession, he released short, sharp passes to feet, and then made himself available once more to receive the ball. Every time Real Madrid started an attack, it would have had to go through Redondo. He was the true orchestrator of the side. He added another league winner’s medal in the 96/97 season before announcing himself on the European stage. His patient, assured style was certainly suited to the Champions League, and it was a major factor behind Real Madrid’s success in the competition during that period. Having a central midfielder that was physically imposing, as well as technically superior to most opponents, was a luxury that Real Madrid used to full effect. He dominated games with ease, linking well with midfield partners Clarence Seedorf and Christian Karembeu. Real Madrid eventually beat a strong Juventus side to win the Champions League in 97/98. Redondo pulled the strings as his side ran out 1-0 winners, despite coming up against a ridiculously talented midfield three of Deschamps, Davids and Zidane. The pinnacle of the Argentinean’s career came in the 99/00 season. Real Madrid were looking to add another Champions League trophy to their collection, and Redondo was to be the man that guided the side. He struck a strong understanding with new midfield side-kick Steve McManaman, the Englishman’s willingness to close down left Redondo with much more space to inflict damage with his frighteningly accurate passing. He made games his own; it was as if he was untouchable at times. One of his greatest performances came against the defending European champions Manchester United in the quarter finals. Up against one of the finest midfields in Europe, Redondo simply destroyed and created in equal measure. His defining moment of the match was a mesmerising piece of skill that bamboozled Henning Berg. Real Madrid went on to win the Champions League once more after beating Valencia 3-0 in the final. Redondo also gained the personal accolade of ‘Most Valuable Player’, highlighting just how good he was throughout the tournament. After the European success, Redondo was sold on to AC Milan for £11 million, much to the disgust of Real Madrid fans. The move was highly controversial, resulting in many protests from the Madrid Ultras. Unfortunately, Redondo was one of the first to be sacrificed for the Galacticos experiment that would soon follow – his fee going towards the money paid to Barcelona for Luis Figo. Upon arriving at Milan, Redondo was injured in one of the first training sessions – he didn’t play for the next two and a half years. The lack of games – only 16 in total over his four years at the club – made Redondo decide to suspend his wages and return the house and car that Milan had bought him. This highlights the proud character that he was; he just wanted to play football. In 2004, after yet another knee injury, Fernando Redondo finally retired. Following his move from Real Madrid, his career began a downwards spiral which robbed him of too much playing time. Looking back on his ten years in Spain, there is no doubt that he was one of the best ever. In Argentina he is remembered fondly, with youngsters who play the famous ‘Number 5’ role often being excitedly named ‘The new Redondo’, but we know there will never be another quite like him. 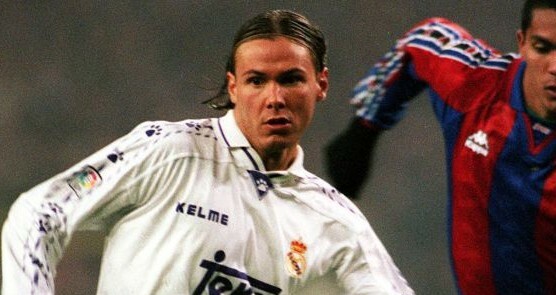 I was too new to the sport to fully appreciate what Redondo brought football-wise to those late-90s Real Madrid sides. But even to a new young fan, it was always clear that Redondo, the character, was larger than life. Just always in control, never panicked. He made the rest of the team feel superior. I hate to say it, but seeing the current team run roughshod against every other team only to regularly lose their marbles when up against Barcelona just serves to highlight how valuable Redondo was. A true Madridista legend! Thanks for this.